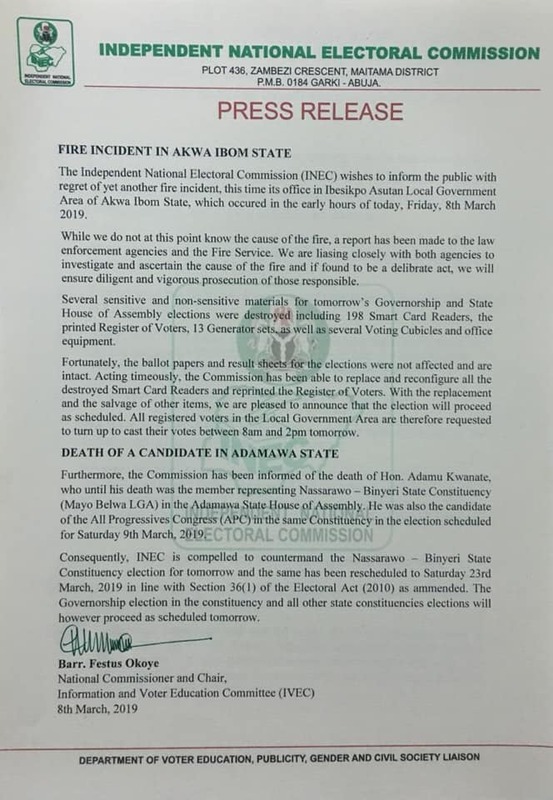 The Independent National Electoral Commission (INEC) has released a statement confirming that its office in Ibesikpo Asutan LGA of Akwa Ibom State was razed by fire in the early hours of Friday, March 8th, 2019, 24 hours to the Governorship and State House of Assembly elections. The statement signed by Festus Okoye, said the incident has been reported to relevant authorities. The commission added that sensitive and non-sensitive materials, including 198 Smart Card Readers, Register of Voters, Generator sets, Voting Cubicles were destroyed. The statement said Ballot Papers and Result Sheets were not affected. It said that the elections will proceed as scheduled. The commission also countermanded elections in Nassarawo – Binyeri State Constituency election over the death of the incumbent House of Assembly representative for the constituency, Adama Kwanate, who was also running for re-election. The election in the constituency has been moved to March 23rd.